This Praise & Worship CD/DVD combo includes 16 of your favourite songs plus a DVD showcasing 6 fantastic videos! It features Delirious, Darlene Zschech, Brian Doerkson, Robin Mark, Kathryn Scott and many more. 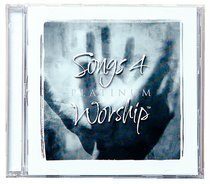 About "Songs 4 Worship Platinum Cd/Dvd Combo (Songs 4 Worship Series)"
With modern worship songs from such established artists as Sonic Flood, Lincoln Brewster, Ten Shekel Shirt and many more, this album is an expression of praise from a new generation of worship leaders. Energetic and powerful, yet with a reverential and heartfelt love for God. Powerful, full-on worship from Matt Redman, Tim Hughes, Delirious, Robin Mark and many more! Including 23 popular songs, this double CD is a must for every worship music fan.